I received this from Simona Pellegrini in exchange for an honest review. As always, my reviews are fair and non-bias. Seventeen-year-old Arianna is a kind of genius, with an insatiable appetite for science and a rational explanation for everything. How, then, could a ‘brainiac’ like her accept that she is in fact the Angel of Light, and is being hunted down by one of the Seven Princes of Darkness? Angels and fallen angels form an unlikely alliance to protect her and train her for the battle ahead; but no matter how hard they try, none can get past her rational barriers and make her fully commit. None of them except Keaghan Blake, the blue-eyed demon charged with her protection. Keaghan seems to be the only one with the power to tear down the fortress around Arianna’s heart and persuade her to take her rightful place in the fight against evil. But Keaghan isn’t just ‘any’ demon, and Arianna learns that getting close to him would have catastrophic consequences for her, and would jeopardise the entire mission. Then why can’t she stay away from him? The ‘brainiac’ knows what she ought to do. But will Arianna listen to her head, or will she fall into temptation? Angels and especially Fallen Angels, are my Paranormal and Fantasy go-to read, whatever the story. 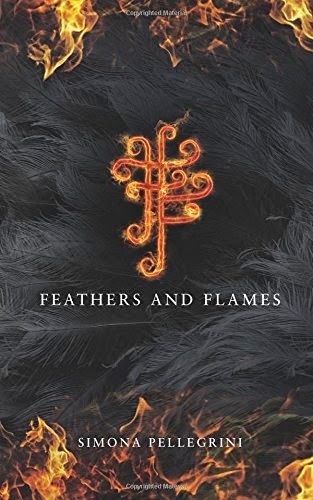 So I was beyond thrilled to get the chance to read Feathers and Flames - from the enthralling synopsis to the gorgeous and dazzling cover - I was hooked. Arianna is a smart, immediately engaging narrator, so much so that it's hard not to be pulled into her story from the very first page. At first, we see Arianna out of her comfort zone at it ultimately makes her so relateable to real life people, seeing a character in another country or out of their comfortable territory. But when she's back at school with her (incredible) friends; Megan, Kayla and Julian, Arianna is the self-confessed brainiac they know her to be. But there's been something on her mind - the gorgeous stranger who she can't seem to stop bumping into everywhere she goes - who has now turned up at her school too. His name is Keaghan Blake, blue-eyed and catching Arianna's attention whenever he's in the room. But suddenly, the strange things that have been happening to Arianna come to a halt when she's thrown head first into a battle she never thought in her wildest dreams could have existed - especially when she is the key to everything. Now, everything is clearer in a way, but perplexing in another. She's torn between who she was destined to become and having the will and strength to fight the evil that is coming her - and her friends - way. Especially when she isn't sure where her feelings for Keaghan fit into everything, and if he feels the same way about her that she did for him. Feathers and Flames is without a doubt, an alluring, enchanting and fascinating novel. Simona created a world where Angels, Demons and Fallen Angels exist, where friends are our saviours and love is like a chaos filled battlefield. I completely adored Arianna and Keaghan and it's so rare to care for the other characters in the books like Arianna's friends as much as I did, too. There wasn't a moment when I could tear myself away from the pages once I was reeled in to their mystifying and compelling world. Overall, Feathers and Flames is an angelic and irresistible novel that has to be one of the best I've read all year. If you haven't read it or added it to your to-read, you're missing out on something magical. All Arianna and Keaghan scenes! And I loved Bruna - she was an amazing character. Young Adult Fantasy and Paranormal readers! You need to read this. Have you read Feathers and Flames? This one is going on my TBR right now! I love that cover and your review makes it sound amazing! Cannot wait to read it!